:nth-child considers all sibling dom elements for counting (irrespective of type). e.g. if p has siblings div, span, p, etc., :nth-child on p will consider its all siblings when counting. :nth-of-type considers sibling dom elements of only same type for counting. e.g. if p has siblings div, span, p, etc., :nth-of-type on p will only consider p siblings when counting. 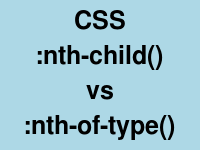 Using :nth-child change background p element if it is at 2nd position in all its siblings. Here the :nth-child pseudo class style applies to all p direct child elements of div of class foo. Since we used direct child selector using (.foo > p:nth-child(2)) nested <p> elements are unaffected. For more information you can see CSS – direct child vs any descendant selector. Using :nth-of-type change background p element if it is at 2nd position in its p siblings. Here also the :nth-of-type pseudo class style applies to all p direct child elements of div of class foo. The counting is done considering only dom siblings of p type in the container.